The price is even cheaper!!! 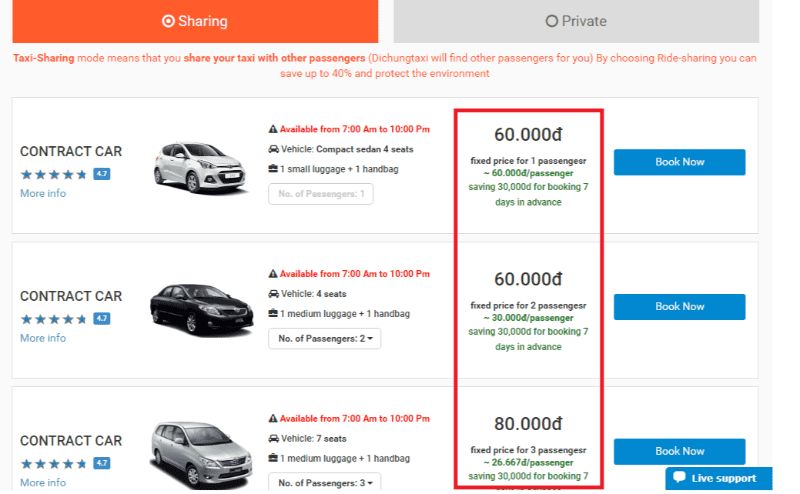 More benefits from DichungTaxi: when booking airport transfer at least 7 days before your departure time at Dichungtaxi.com, you will get a discount of 30,000 VND. Let’s enjoy airport transfer with super cheap price! With sharing service, customers will already save 40% of the cost compared to private service. Now, if the car is booked before 7 days, you will be reduced 30,000 VND. Super Saving Price!!! Shared or Private taxi - English Support (24/7) – Book in advance - Free Cancellation - We offer quality and safety for the users at an affordable cost in Vietnam!